In the second of a series of occasional interviews with key players in the entertainment industry, the BBC News website speaks to Brad Duea, president of online music service Napster. The last two years have seen the virtual transformation of the global music industry due to physical and online piracy, falling sales of CDs, and the rise of legal downloads and portable music players such as the iPod. But the impact has been as great on consumers, who have seen the way they can buy and use music change just as radically. No company represents that shift in the music industry better than Napster. Once a byword for piracy, it is now a firm at the vanguard of online services. 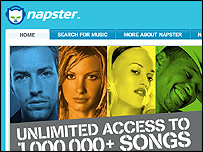 Napster has around 410,000 subscribers who pay up to £14.95 each month to gain access to about 1.5 million songs. It was once a file-sharing service that let people exchange music, usually pirated, and other files. But after the US courts shut it down, the power of its brand remained. Mr Duea says: "The number one brand attribute at the time Napster was shut down was innovation. The second highest characteristic was actually 'free'. "The difference now is that the number one attribute is still innovation. Free is now way down on the list." Technology firm Roxio bought the Napster brand from the ruins that was left of the file-sharing service and relaunched it as a paid-for operation. The global music market is now worth $33 billion (£18.3 billion) a year while the online music market accounted for around 5% of all sales in the first half of 2005. Just a handful of legitimate online music stores were in existence two years ago - now there are around 300 different services up and running. Mr Duea says the online music industry will become an "exploding multi-billion dollar space in the next two years". "It's larger than a niche but not yet mainstream," he says. As CD sales remain either flat or falling in many countries, some observers are predicting that digital sales will outstrip physical sales in the near future. But Mr Duea says that day has already come for hundreds of thousands of people. "Many people have moved beyond buying plastic at retail and have moved to digital only already," he says. "People are able to search for more music than was ever possible at retail, even in the largest megastore." Mr Duea talks about Napster as an "experience" rather than as a retailer. With features such as friends' lists, recommendations, the ability to swap playlists, access to more than a million songs and carry potentially tens of thousands of songs with you wherever you go, it is clear that use of a service like Napster has little in common with popping into HMV or Virgin to buy a record. Many CDs, says Mr Duea, are "a forced bundle by the labels". "If you are a subscriber you can listen to the latest CDs and never again be caught buying a bad CD which has one hit song and all the rest are crap. "The consumer got caught buying CDs which only had one good song. Now what it will move to is rewarding those artists that put out great music that people listen to." Mr Duea says online music sales can transform the whole spectrum of music production and consumption - from artist to music lover. He says Apple boss Steve Jobs has "tricked people into buying a hardware trap" as iTunes songs can only be taken away and played on an iPod. And the ubiquitous iPod itself can play paid-for songs with copy protection that are bought from iTunes and none of the other services, but it can play any MP3s. Apple's approach means the market remains essentially cut down the middle - between the iTunes service, which works only on the iPod, and services which use a Windows Media format, essentially everyone else. "The dream is that Napster would work on any PC, any player in any territory and work seamlessly," said Mr Duea. Napster's subscription model has been criticised by some because users do not "own" the music. It remains as part of their collection - either on a PC or on a portable player - for only as long as they continue to subscribe. "A lot of time people think of ownership as this ultimate thing with music. "Has owning cassettes in the past really benefited people? In many cases they have had to repurchase music in a new format. "I do not think the argument about ownership is such a wonderful thing. What do you really want as a music fan? It's to access music and listening to music." Despite the explosion in legitimate music services, the industry has been criticised for reacting slowly to new technologies. Mr Duea says: "There are still people with a myopic view of music and are fearful of a cannibalistic effect of digital on their cash cow plastic retail business."